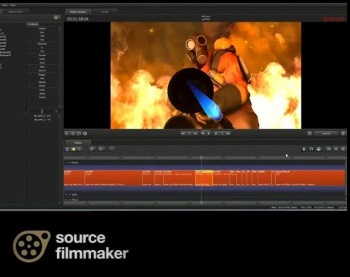 Valvetime sleuths uncover evidence for a next-gen engine, hidden in Filmmaker system files. "We don't like to brag," says Valve's official website, "but Source is considered the most flexible, comprehensive, and powerful game development environment out there. And it's about to get even better." How much better, you ask? A next-gen upgrade would seem to be the answer, as a bit of errant code hidden away within Filmmaker - released last month on Steam - refers to a mysterious beast known only as Source 2. "Return an str with the current engine version," says the code, "if key doesn't doesn't exist, assume 'Source', otherwise invalid -- assume next-gen 'Source 2'," According to posters on the Valvetime forum, there are upwards of 60 other references to the Source 2 engine hidden in Filmmaker's code, including a hint that something called Hybrid is somehow involved. There's no way to know what Hybrid is or does; the Valvetime posters speculate that this is the base for Source 2, but without anything official from Valve it's impossible to be certain. Source has been Valve's game engine for donkey's years. It powers everything from Half-Life to Left 4 Dead, but time marches on and these days Source is looking ragged around the edges. Back in 2011, Gabe Newell admitted that this was a problem. "So, our current tools are... very painful, so we probably are spending more time on tools development now than anything else and when we're ready to ship those I think everybody's life will get a lot better." The code lines in Filmmaker may hint that they're a lot closer to ship now than ever before.